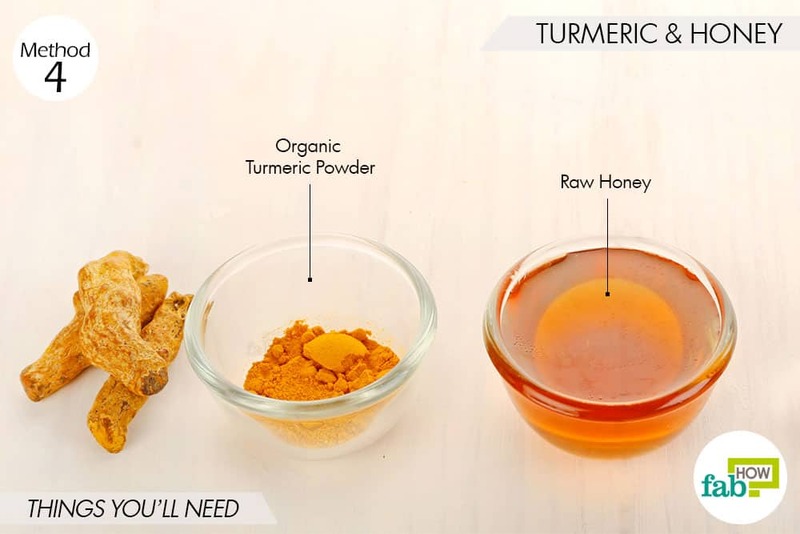 When it comes to beauty, there is no match to turmeric for successfully giving you lighter and glowing skin. 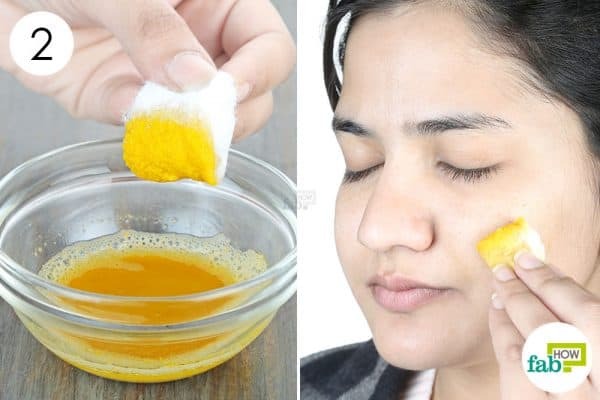 It is for this very reason that turmeric is applied on the skin of Indian brides and grooms to give them a healthy glow on their big day. But turmeric isn’t just meant to be used on special days. 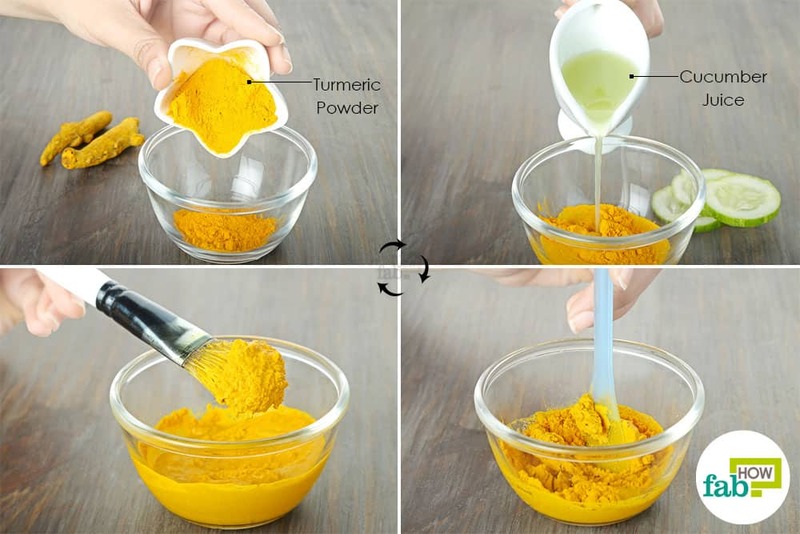 A key ingredient in Ayurveda, turmeric has been used for ages for its countless health benefits and beauty uses. Derived from the curcuma longa plant, the bright yellow spice is loaded with antioxidants that fight free-radical damage in your skin. Plus, its antibacterial and anti-inflammatory properties can naturally heal skin troubles. Turmeric also has been proven effective in reducing the melanin production that is responsible for a dark complexion or hyperpigmentation. Irrespective of the cause, turmeric can successfully deal with all skin troubles to give you a lighter skin tone naturally. 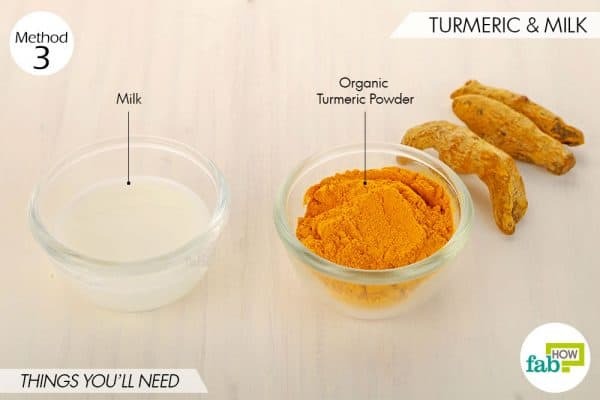 Here are the 10 best ways you can use turmeric along with other ingredients to lighten your skin. Be persistent with your efforts. 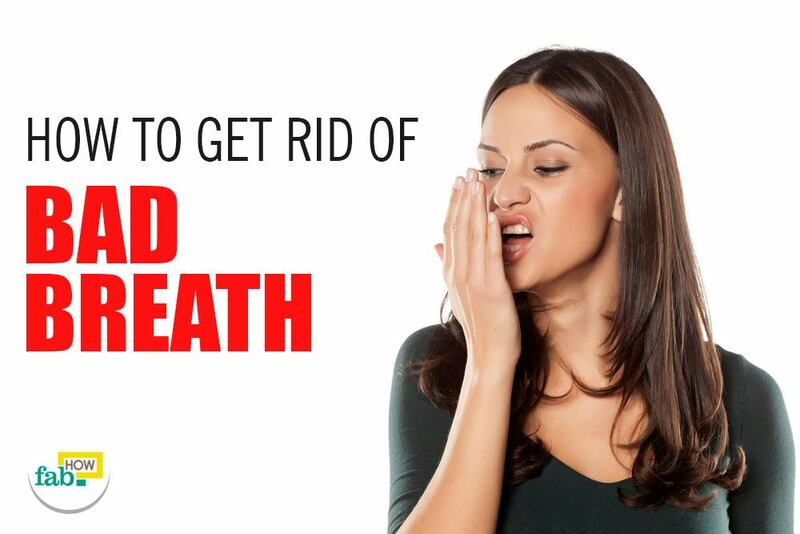 It can take 1 to 2 months of regular use to get the desired results. 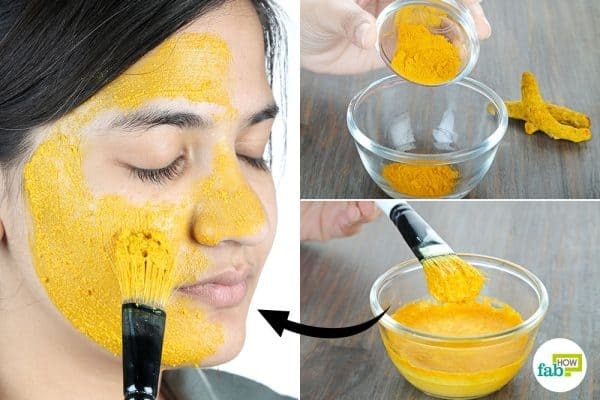 Note: Do a patch test to check for any adverse reactions before applying any of the turmeric packs on your face. If it causes any skin irritation, wash it off immediately. 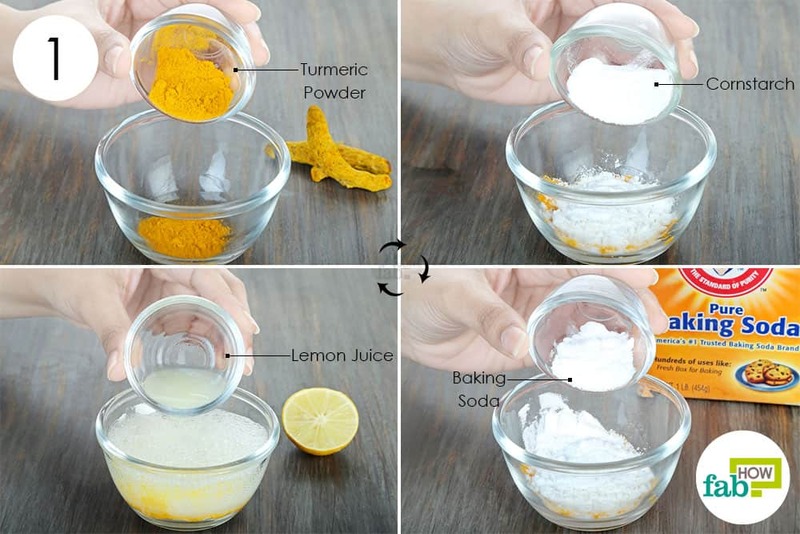 Turmeric and lemon form the best combination for skin lightening. 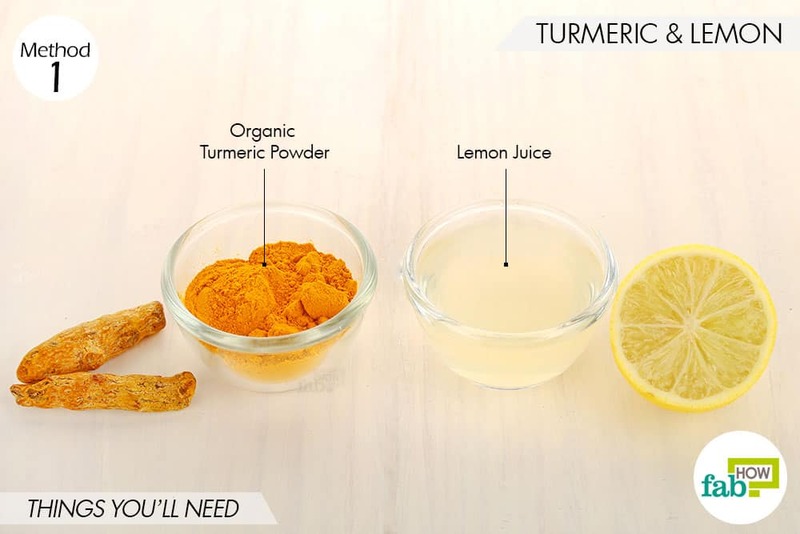 While the turmeric absorbs into the skin and breaks down the melanin, the lemon juice works as a bleaching agent. If you have oily skin, lemon also helps cut down the oil to give you fresher-looking skin. Note: Since lemon can make your skin photosensitive, avoid going out in the sun after using this face mask. It is preferable to use it at bedtime, so there is enough of a time gap before you expose your skin to the sun. Also, if you have sensitive skin, do a patch test first. 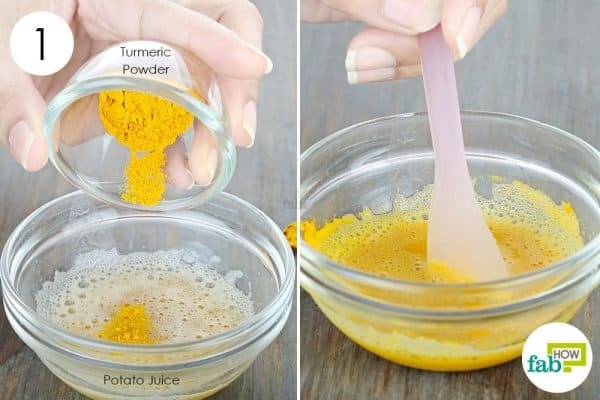 Put 1 tablespoon of organic turmeric powder in a bowl. Add 2 tablespoons of fresh lemon juice. Mix well until you get a lump-free paste. 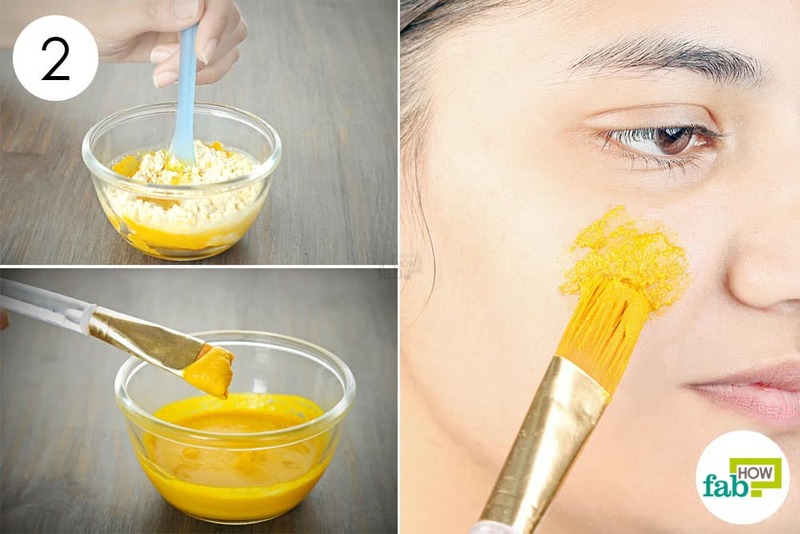 Use an applicator brush to apply a thin layer of the turmeric mask on your entire face, except the eye area. Leave it on for 10 to 15 minutes, then rinse it off with lukewarm water. Pat dry your face and apply a moisturizer. You can use this mask 2 or 3 times a week to lighten your skin. 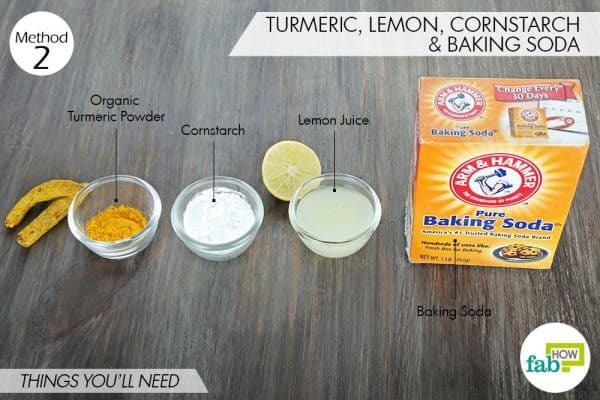 The above skin-lightening blend can be enhanced further by adding cornstarch and baking soda. The vitamin A found in cornstarch helps lighten the spots and blemishes. It also helps absorb excess oil from your skin pores. The baking soda works as an exfoliant to slough off dead skin cells and dirt that can accumulate and make your skin appear dull. 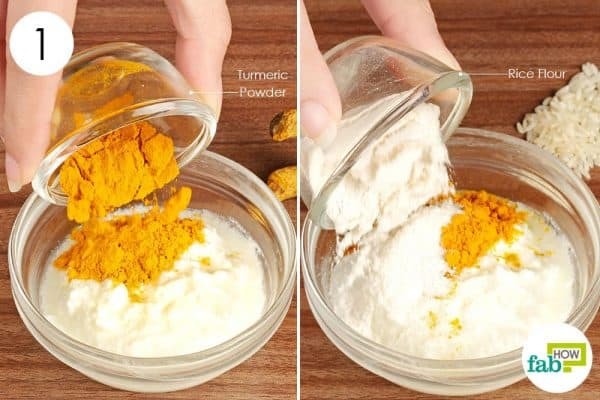 Put 1 teaspoon of turmeric powder in a bowl. Add 1 tablespoon each of cornstarch and baking soda. Add 2 tablespoons of fresh lemon juice as well. Use a spoon to whip up all the ingredients into a uniform paste. Apply an even layer on your face using an applicator brush. Leave it on for 30 minutes, then rinse it off with cool water. Pat your skin dry and apply a good moisturizer. 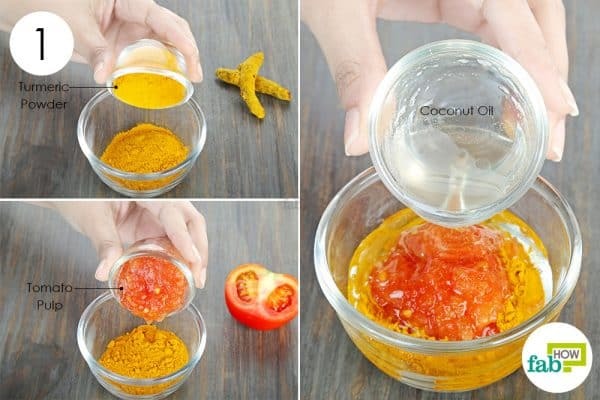 Apply this mask 2 or 3 times every week to lighten your skin in 1 to 2 months. 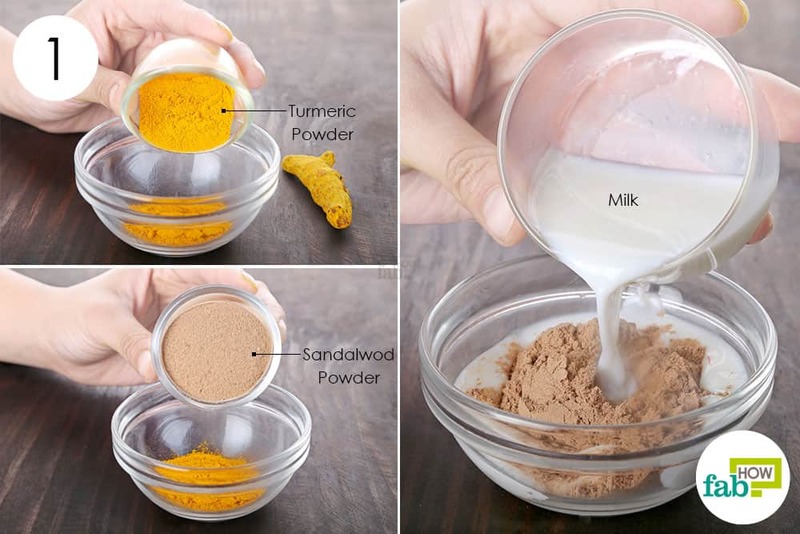 Turmeric combined with milk forms an excellent cleansing mask for skin lightening. This particular recipe also works well to get rid of a suntan. 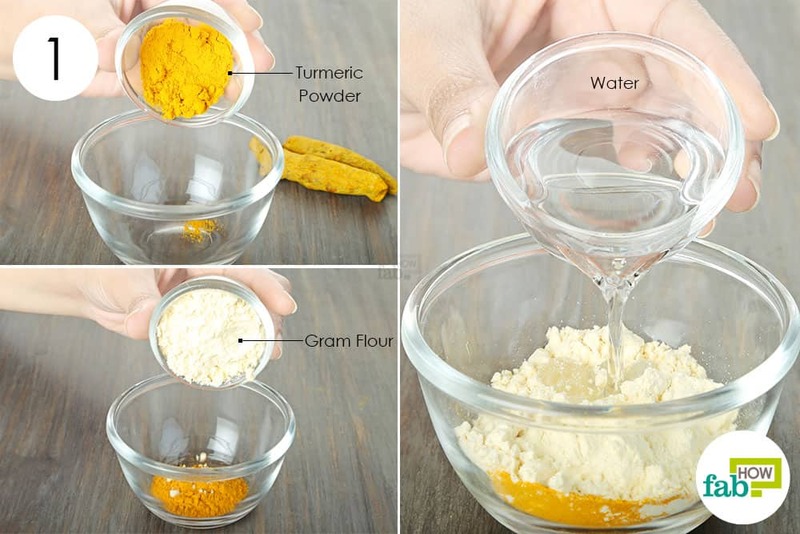 The turmeric breaks down the melanin cells and curbs their production. The lactic acid in milk dissolves dead skin cells and impurities, while also leaving a bleaching effect on your skin. Note: Use whole milk if you have dry or combination skin. Use skim milk for oily skin. Add just enough milk to make a thick paste. 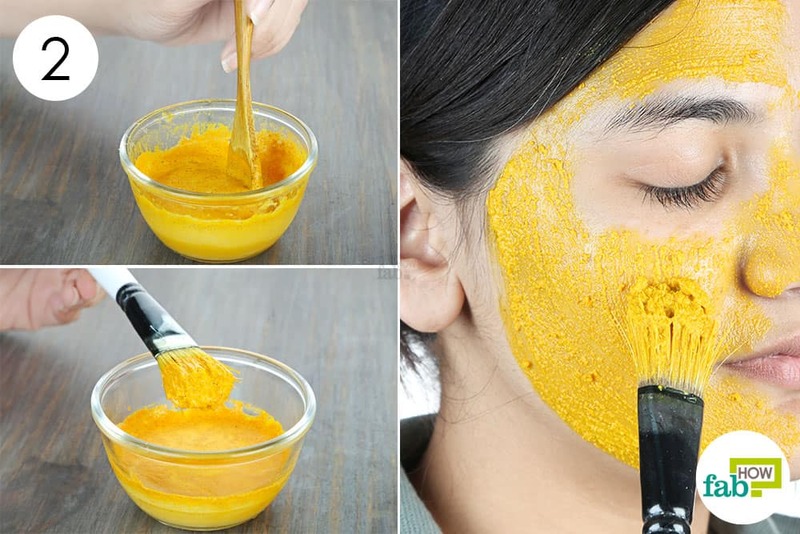 Apply a thin layer of the turmeric mask all over your face and neck. Wait for 15 to 20 minutes before rinsing it off with plain water. Pat dry your face and apply a light moisturizer. 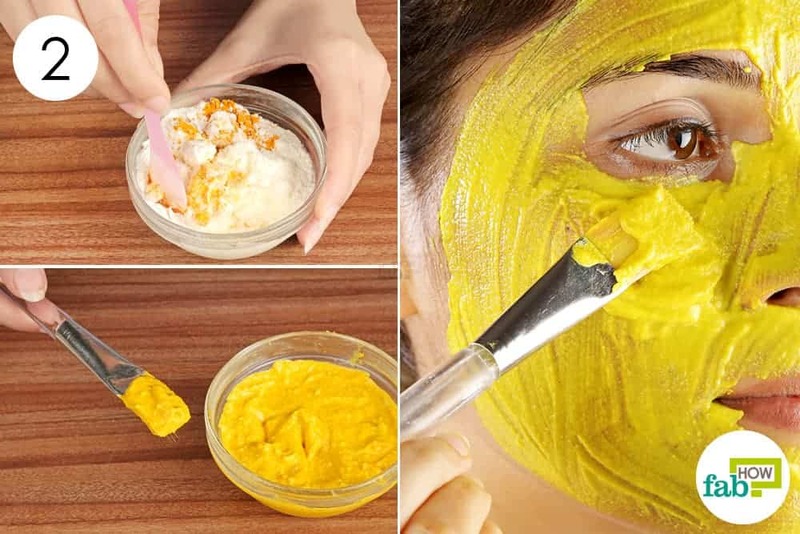 Apply this turmeric mask 3 or 4 times a week to get lighter and glowing skin. 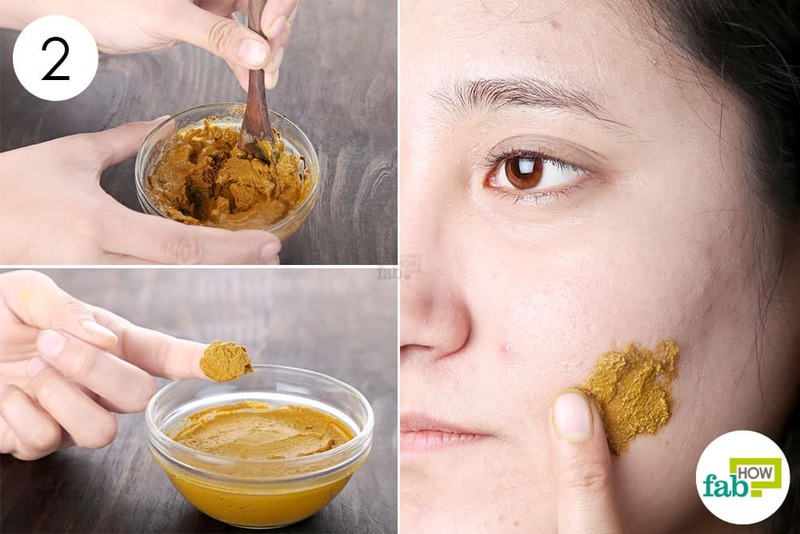 For those with dry or combination skin, a blend of turmeric and honey can also help lighten your skin and make it supple. 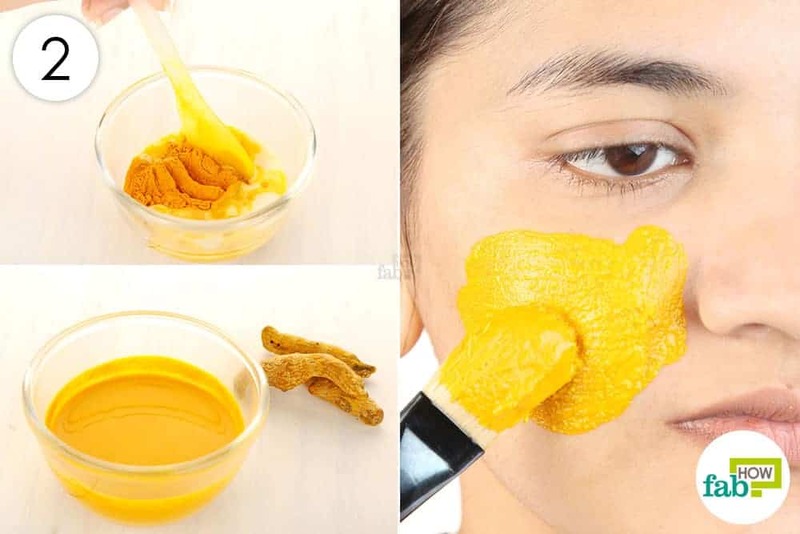 Turmeric helps lighten your skin tone. Honey works as a natural humectant, drawing moisture from the air and sealing it into your skin. Both ingredients are also antibacterial and help ward off infections and breakouts. Put 1 teaspoon of organic turmeric powder in a small bowl. 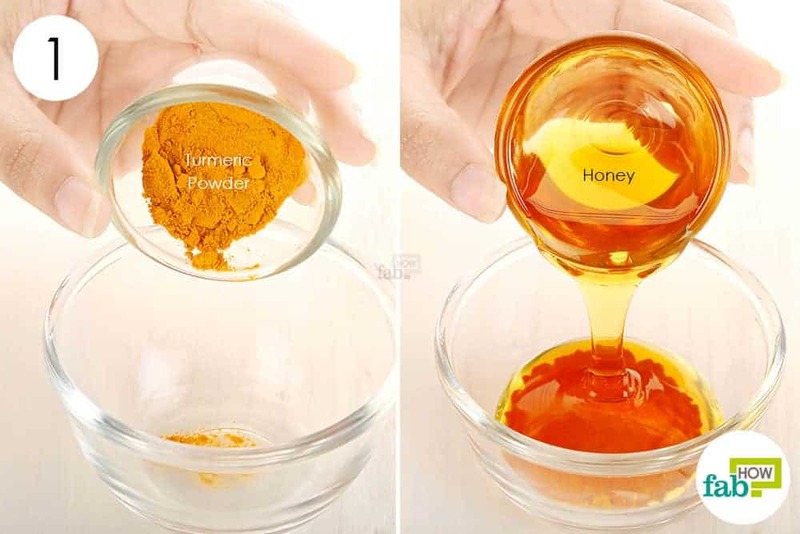 Add 2 tablespoons of raw honey to it. Use a spoon to mix the two ingredients thoroughly. Apply it on your face using an applicator brush. Avoid the eye area. Leave it on for 15 to 20 minutes, then rinse it off with tepid water. Pat your skin dry. You need not apply a moisturizer, as the honey will leave your skin moisturized. Use this mask 2 or 3 times a week to get soft and lighter skin. If you have naturally oily skin, it’s common to suffer from breakouts and an uneven skin tone. Using turmeric along with cucumber can benefit you in multiple ways. Turmeric works as an antibacterial agent on the breakouts and also lightens your skin tone. Cucumber acts as a mild astringent, shrinking large pores to reduce oiliness. It also helps hydrate your skin without clogging your pores and gives you fresher-looking skin. 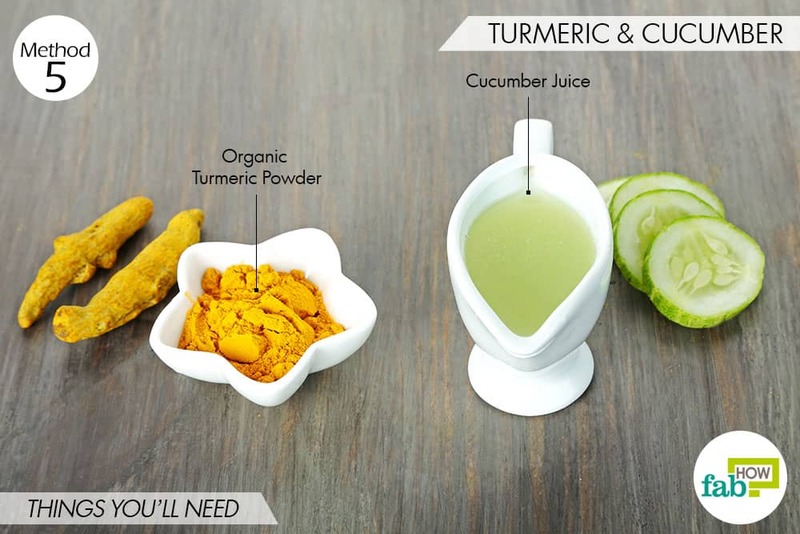 Mix ¼ tablespoon of organic turmeric powder and 2 tablespoons of fresh cucumber juice. Use an applicator brush to apply the blend on your face and neck. Avoid the eye area. Leave it on for 1 hour, then rinse your skin with lukewarm water. Apply this mask 3 times a week to get oil-free and lighter skin. Want to soothe and brighten up your dry and itchy skin? Try this homemade face mask made using turmeric, tomato juice, and coconut oil. 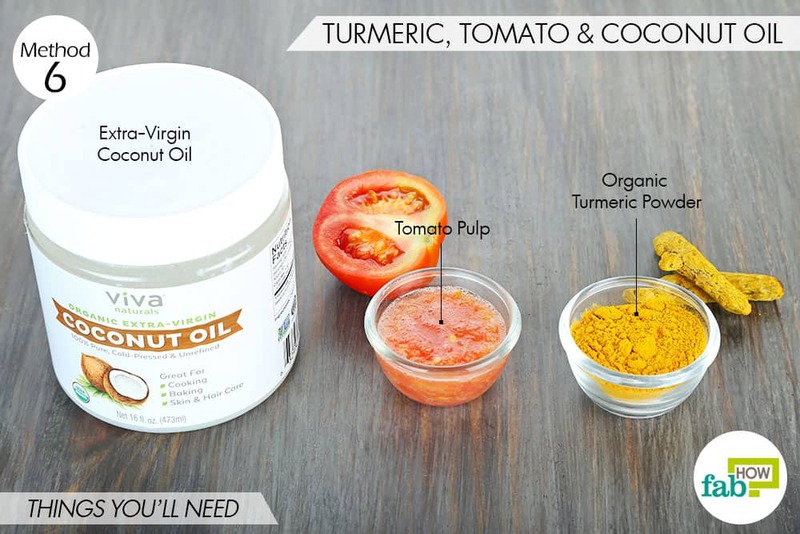 Tomatoes are rich in beta-carotene, an antioxidant that aids healthy skin cell renewal. Both tomatoes and turmeric heal skin irritation, while turmeric also lightens skin in the process. Coconut oil contains healthy fatty acids that deeply moisturize the skin to alleviate dryness and itching. It also forms an antibacterial layer on the skin. Add 1 tablespoon of fresh tomato pulp. Add 1 tablespoon of extra-virgin coconut oil as well. Using a clean brush, apply the turmeric mask on your face and neck. Avoid the eye area. Use your fingers to massage your face for 10 minutes. Let the mask sit for 15 minutes before you rinse it off with cold water. Apply this healing mask once daily to reduce dryness and lighten your skin naturally. 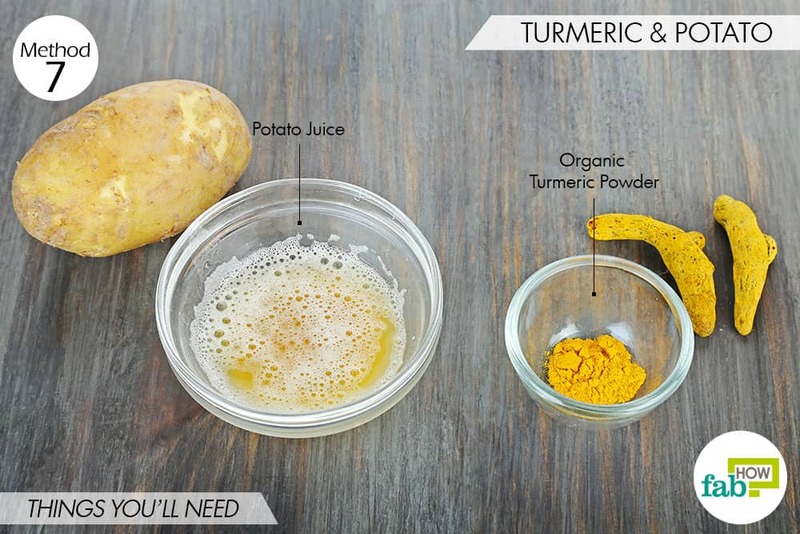 Turmeric can also be combined with potato juice to work as a bleaching face pack. Regular use of this face pack will help reduce hyperpigmentation and lighten any dark spots. 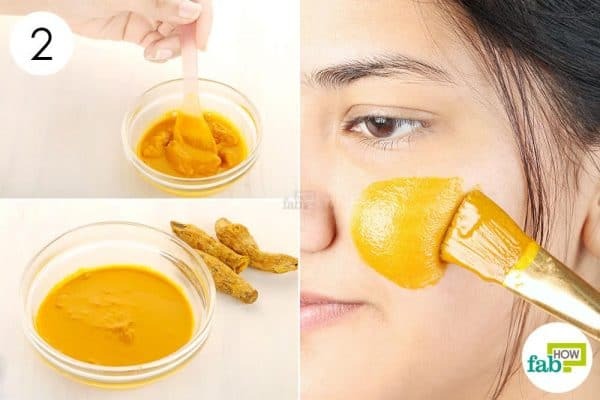 The turmeric will control the melanin formation in the skin, and the potatoes contain a compound called catecholase that functions like a natural bleach. Extract the juice from 1 large potato. Add a ⅛ teaspoon of turmeric powder to the juice. Soak a cotton ball in the solution and dab it all over your face. Let it dry completely, then rinse your face with lukewarm water. Apply this blend twice every week to achieve a lighter skin tone. 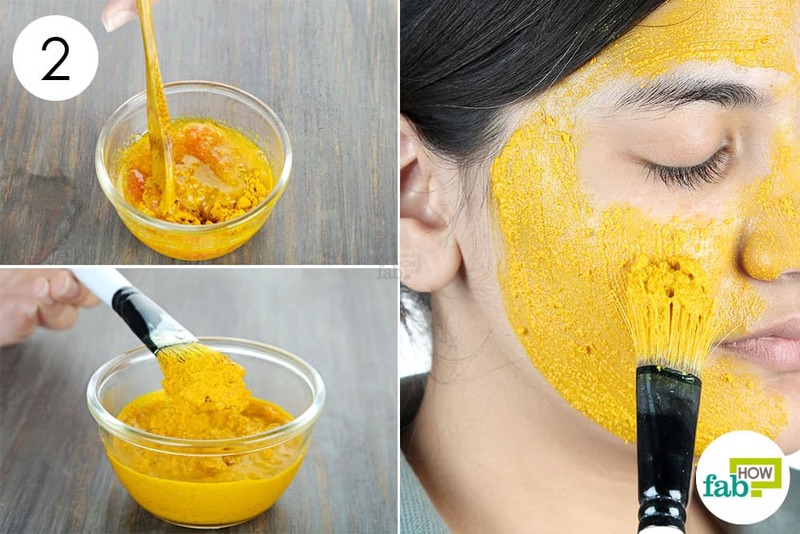 This is probably the most popular homemade mask used in India to lighten skin naturally. 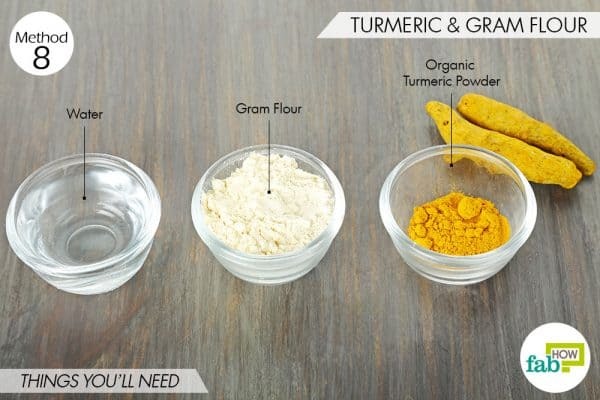 Turmeric combined with gram flour can deal with your skin troubles and give you a brighter skin tone. While the turmeric breaks down melanin cells, the gram flour acts as an exfoliant and cleanser to clear away dead skin cells and impurities. It also helps absorb excess oil, thus making it a hit for people with oily skin. Add 2 tablespoons of gram flour to it. Add enough water to make a spreadable paste. You can also use rose water instead of plain water for added hydration. Mix the ingredients thoroughly until you get a lump-free, smooth paste. Use an applicator brush to apply it on your face and neck. Avoid the eye area. Scrub your face with the paste for 5 minutes. Let it sit for 10 minutes before rinsing it off with water. Use this mask twice a week to get smooth and radiant skin. Rice flour is the skin-lightening secret of Asians. Rice contains an enzyme called tyrosinase that reduces melanin production in the skin. Both rice and turmeric contain antioxidants that fight free-radical damage and delay the natural aging process to keep your skin firm. 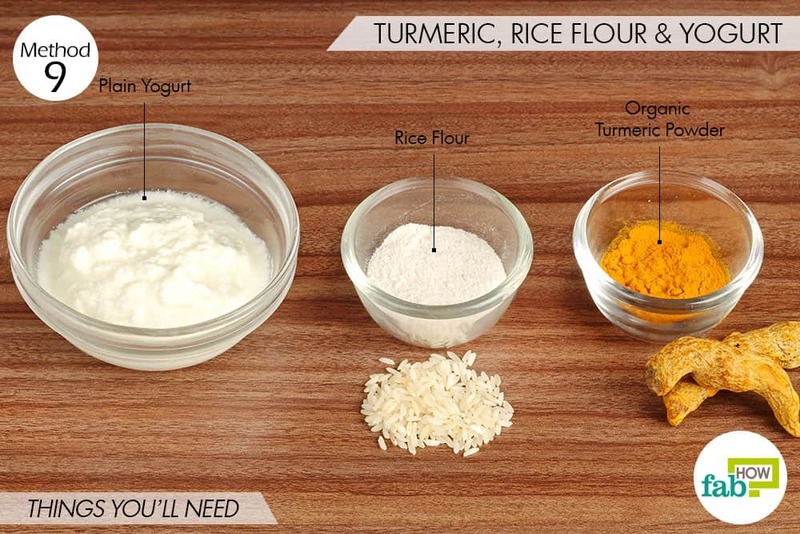 The yogurt used in this recipe works as a cleanser and aids in skin lightening, due to the presence of lactic acid. Put 3 tablespoons of plain yogurt in a bowl. Add 1 teaspoon of turmeric powder and 2 teaspoons of rice flour. Use a clean makeup brush to apply the blend on your face, except the eye area. Let it dry completely, which usually takes 15 to 20 minutes. Reactivate the dried face pack with water and massage it into your skin for 1 minute. Wash it off with cool water and pat your skin dry. Use this skin-lightening homemade face mask 2 or 3 times a week for best results. Lastly, turmeric can be combined with sandalwood powder and milk to lighten your skin. Turmeric, as well as sandalwood, helps treat acne, lighten spots and blemishes, shrink pores and soothe skin irritation. Milk acts a natural cleaner. 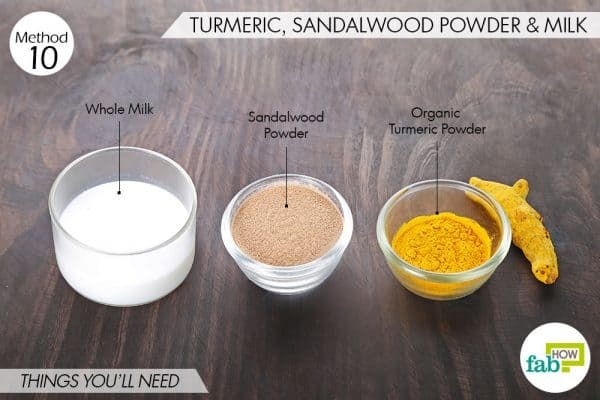 Add 2 tablespoons of sandalwood powder to it. Add ¼ cup of whole milk as well. Use a spoon to mix all the ingredients. Apply the blend on your face, avoiding the eye area. Allow it to dry completely, then rinse it off with cool water. Use this mask 2 or 3 times every week to lighten your skin naturally. Lean over a sink while applying the face pack to collect any drippings. 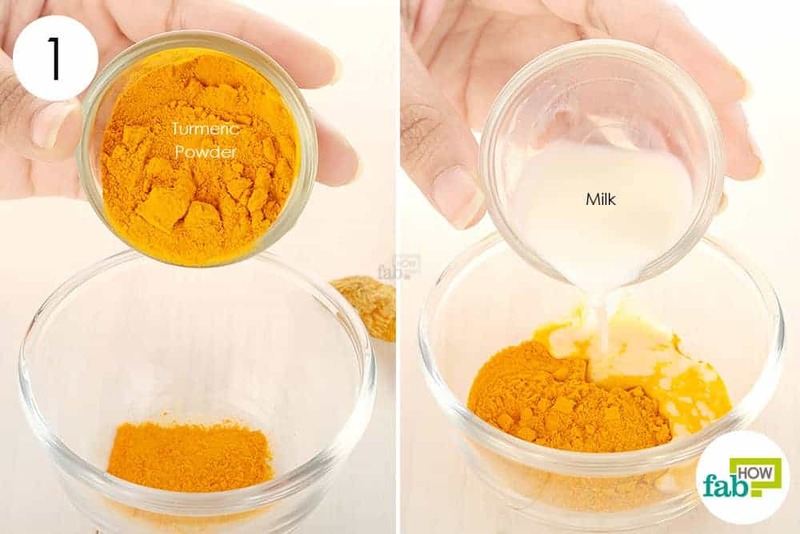 Turmeric can leave strong yellow stains on your clothes. Wear an old T-shirt while applying the face pack. If you do get a stain, you can use one of several remedies to get turmeric stains out of clothing. 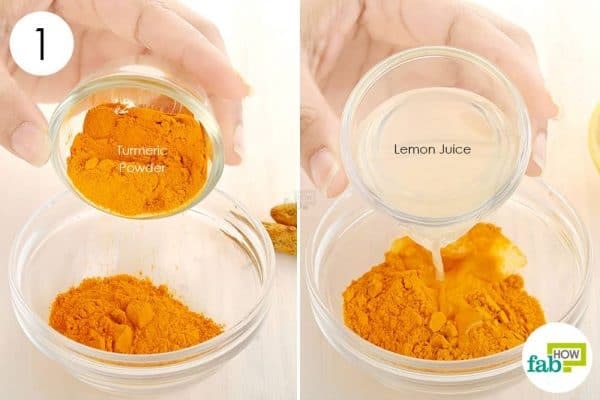 If needed, also check out our remedies to get turmeric stains off your hands. 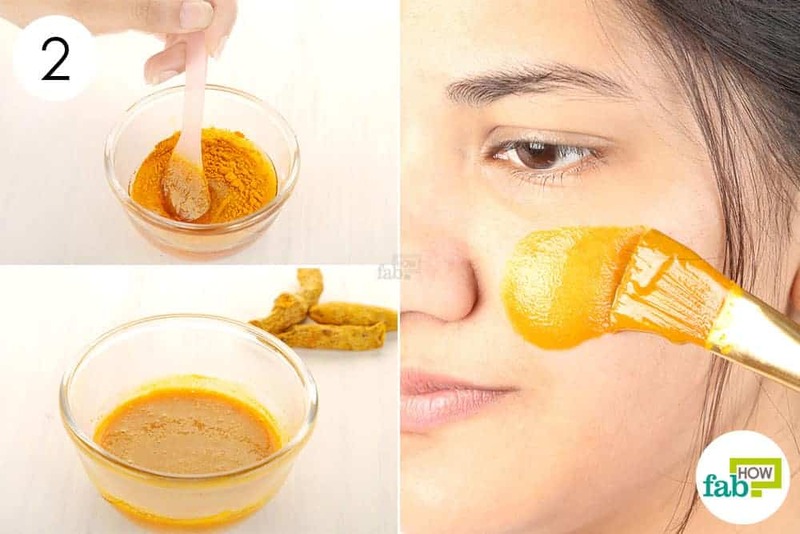 Turmeric-based face packs can leave your face yellow, but you need not worry. It will fade after you wash your face a few times.